Pssst!!! It appears that I have been running I mean walking slowly around with a bit of pneumonia. My doctor has issued a stern warning and put me on a stronger antibiotic. My pneumonia appears to have laughed at the first one. Now that I am sort of behaving, I am looking around at my apartment and thinking about things I would like to do, and I took inventory of my old bottles. 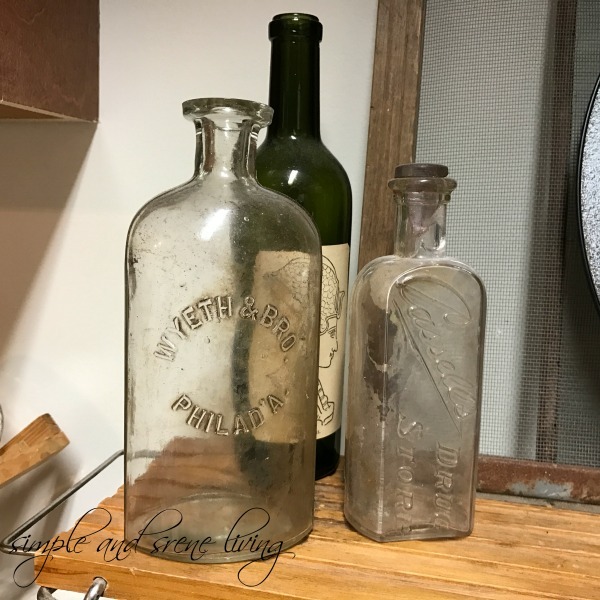 I love vintage and antique bottles. I have collected them for years, but I have had to sell many of them because of lack of display space in my small apartment. I have some in each room. These are in my kitchen. The desk in my dining room. The pine cupboard in my living room. The window in my bedroom. I guess the only room that doesn't have any is the bathroom. I will have to remedy that. What is your favorite collectible? Laura, you better take care of yourself young lady!! I know it takes rest to get better!! Really I hope you feel better soon. I love your old bottles. 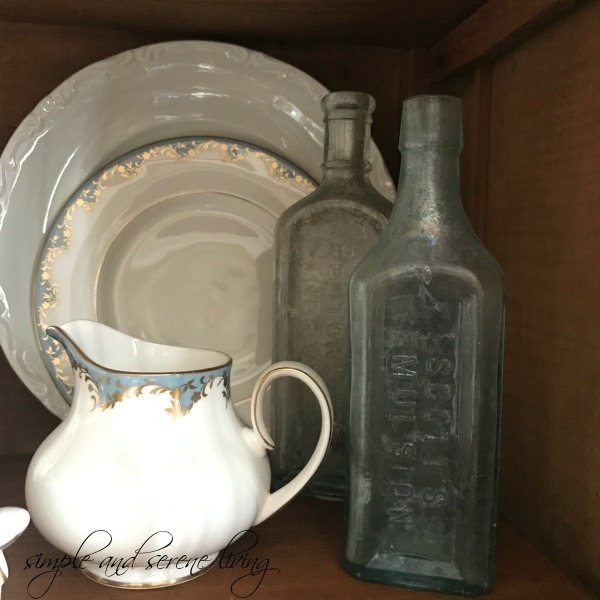 I have a few collections I love, I think pottery is my favorite and I have a collection of white pottery, pink pottery and other pottery including McCoy and Roseville. I'll have to take photos because I think some is in every room of my home including both bathrooms! I'm trying to rest. It just isn't in my nature. SIGH!!! I would love to see all of your pottery, Linda. Laura, I hope this new antibiotic takes care of the pneumonia. And rest is often a main ingredient for healing. It's not easy, and believe me, I know. I like old bottles too, Laura! You have a pretty collection. I think my favorite thing to collect is coffee mugs. I've had to downsize them a few times. Love your vintage bottle collection. Hope this new antibiotic will kick out the bug. You must be the best hostess to have those germs want to stay longer in your body!!!! Wishing you to feel better soon. Hello Laura! This is my first time to visit your blog, happy to meet you! 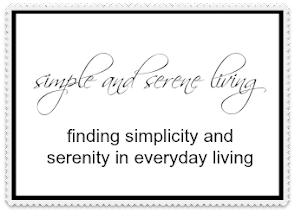 I love your blog title, simple and serene living, so awesome! That is a motto we are following here on our little place too. I do hope that you get to feeling better soon, pneumonia is not fun at all. Rest is one of those things hard to do when you are naturally a doer. Your old bottle collection is gorgeous. I used to collect china and tea cups, but due to our small living space now, that has been curbed. Now, I really don't collect anything. I'm trying to reduce rather than add to.. lol, hard to do. I am so sorry to hear you have pneumonia! Please try to get a lot of rest and take care of yourself so you can heal. 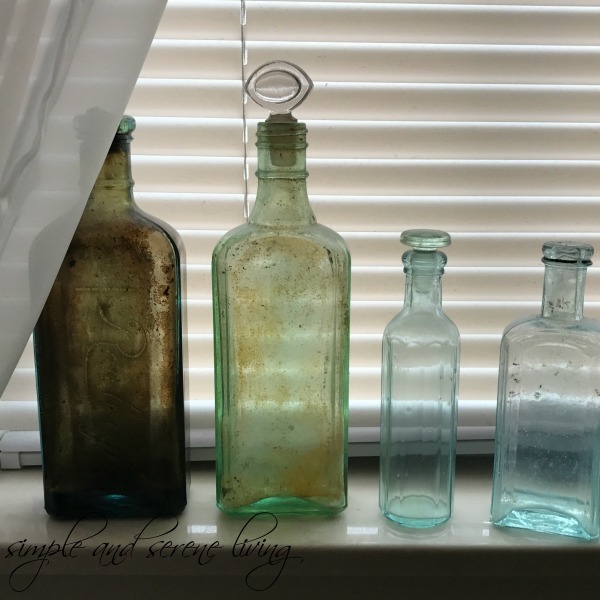 Your old bottles are beautiful...I have a few myself and I love to put fresh flowers from the garden in them in the summer. They're so pretty lined up on a windowsill, too. I sure hope you get over this soon. I know it's really be hard on you. I collect so many things...maybe baskets as a favorite! Take care of yourself sweet lady! Hugs! I am looking for the old ink well bottles the short squaty ones. 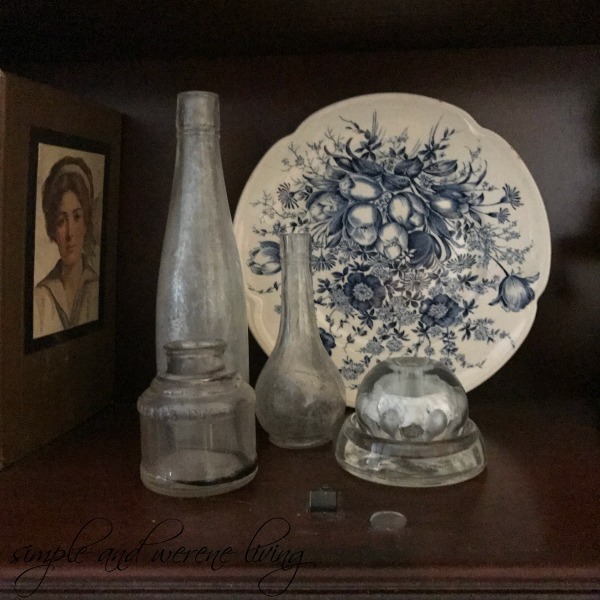 I love old bottles and you have a beautiful collection Laura. I have several of them and a few are in the bathroom. 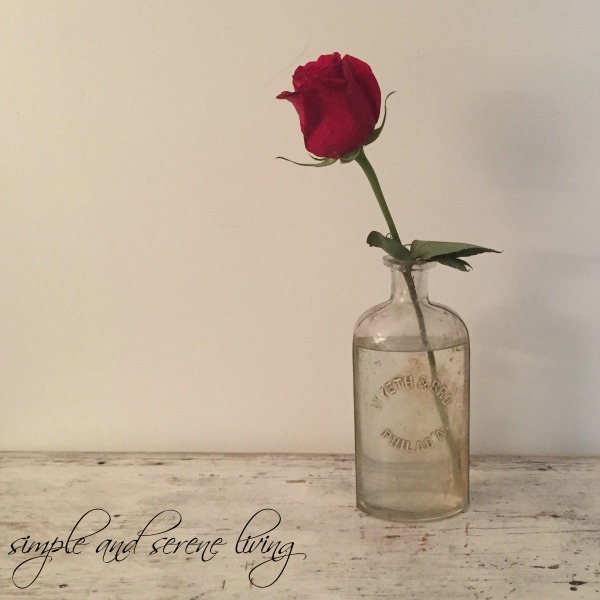 :) Your vignettes are lovely. I hope the new medication for your pneumonia is working and that you are feeling a lot better. Take care. I hope that you are feeling better. I like your bottle collection and how you have it displayed - it's very pretty. I have old bottles too - ones I've found mostly digging.